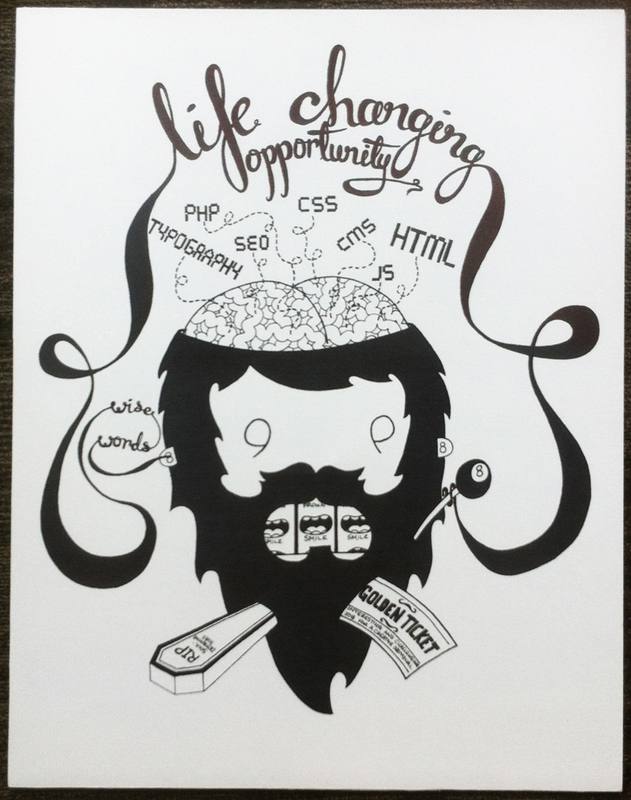 Back in February, we advertised for an Apprentice Web Designer. We weren’t looking for an intern, or someone looking for work experience. 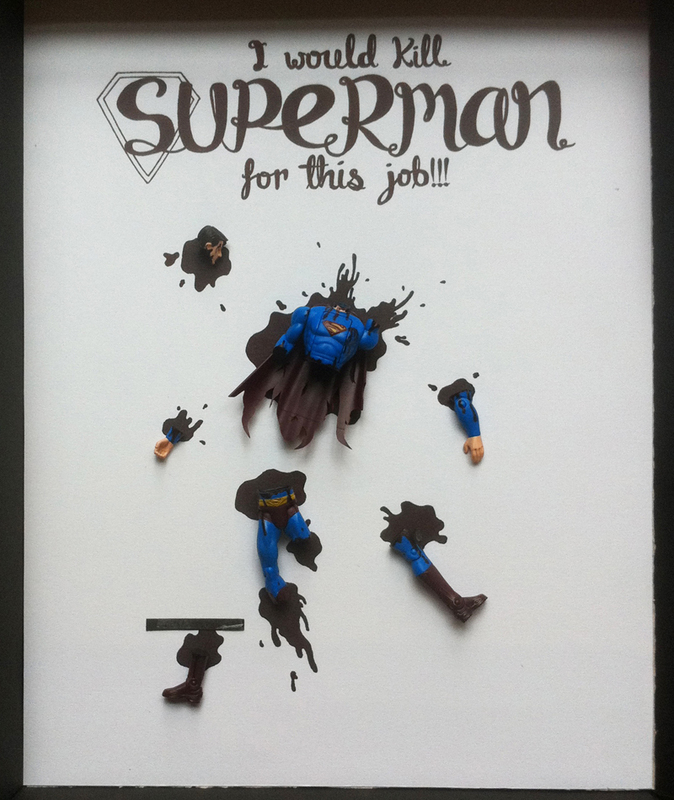 We wanted to hire someone we could teach, nurture and mould into a world-class talent. 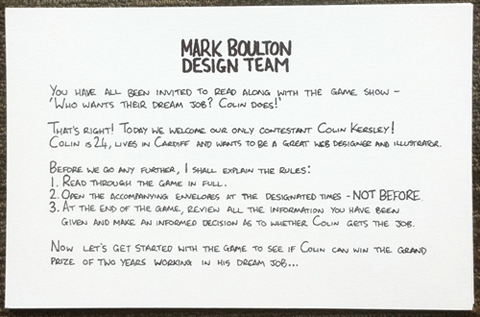 We asked interested applicants to hand write a letter describing why they’d like to spend two years of their life at Mark Boulton Design, learning what we do. 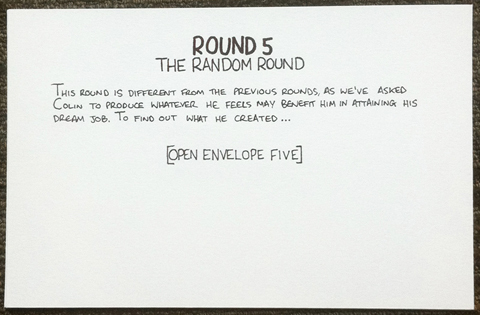 We also wanted to keep it fun and find out what makes them tick, so we gave a more open brief of telling us a story, writing a haiku or drawing us a picture. We were inundated with post from all over the globe; from as far away as Australia, North America and Eastern Europe and plenty closer to home, from all over the UK. After a rigorous selection process involving the whole team, we came up with a ‘Top 10′, three of which were shortlisted for interview. We were so impressed with the standard of the applications, we have decided to blog about our ‘Top 10′ (with their permission of course). We’ll publish that next week. 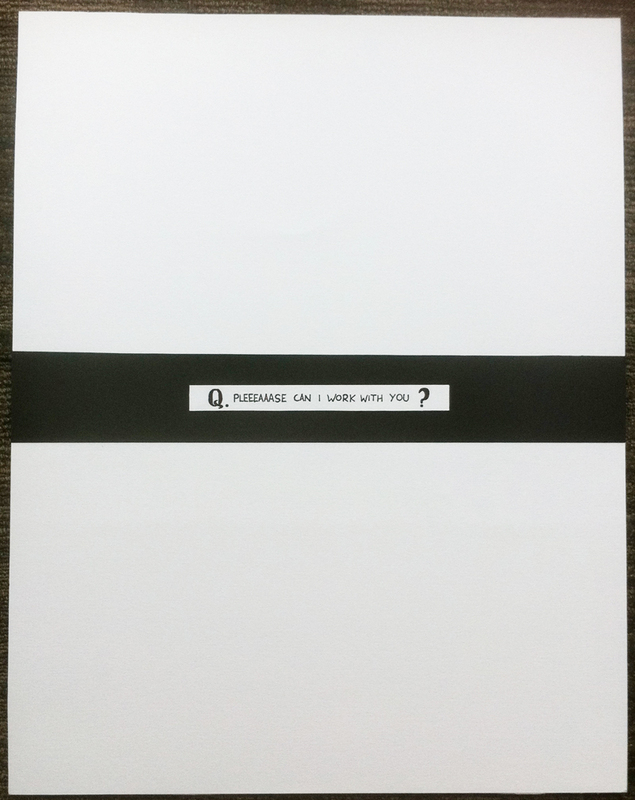 We’re also sharing the winning application from our new Apprentice, Colin. So, what can you learn from Colin’s approach? Get yourself noticed: Colin found us personally on Twitter and asked if he could hand deliver his application to the studio. 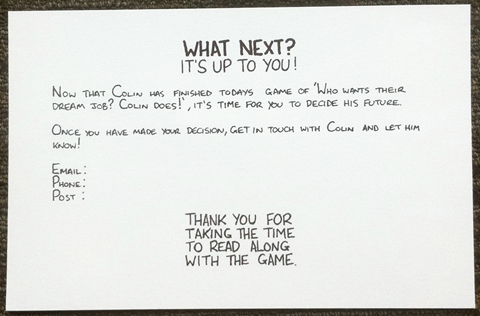 Answer the brief: Colin gave us what we asked for and more. He’d clearly put a lot of careful thought into what he wrote as well as how he packaged it up. 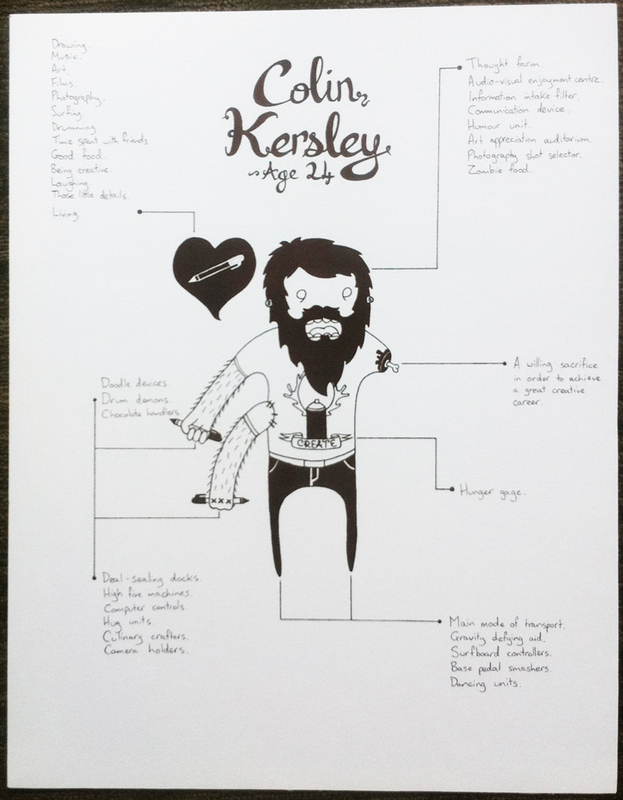 Show your personality: Colin’s application had bags of himself – his sense of humour, his hand writing, his illustrations and it was fun! 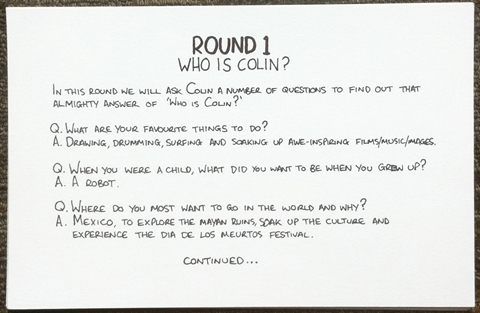 Colin’s ‘game show’ had us all in fits of laughter. Don’t sound needy or beg: lots of our applicants clearly *really* wanted the job but didn’t sell themselves or tell us what value they could add to our team. Everyone can add value, whatever their level of experience. This was clear to us from Colin’s application. Think creatively: we had lots of creative applications and it was a breath of fresh air to look through them all. We felt like we ‘knew’ some of our applicants after seeing what they put together. Ask questions, sound interested: Colin showed that he had thought a lot about if this was the right job for him too – he had some questions for us. Do your research: Despite not coming from a web design background, Colin clearly demonstrated an understanding of the industry, the main industry figures and latest developments. Be articulate: Cut the waffle. 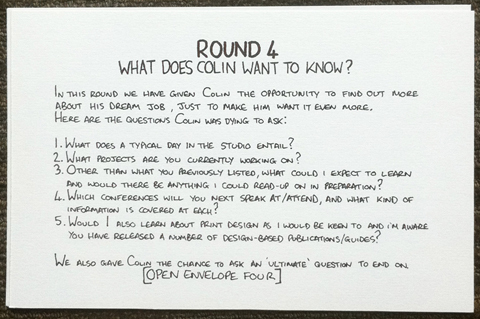 Colin used bullet points and short, concise sentences to sell himself. It’s not about wearing a suit: Colin felt confident enough to come to his interview in shorts (he checked first on the dress code though)! Buy your new colleagues doughnuts: once we’d offered him the job, Colin brought us all Krispy Kremes! Definitely a winning strategy and sealed the deal! 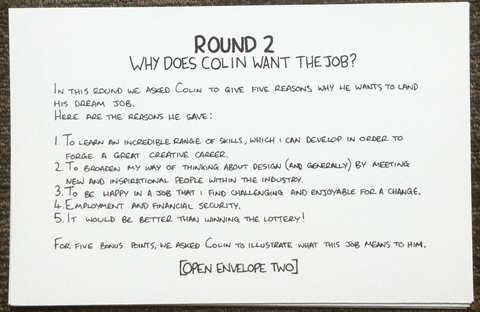 Obviously, Colin’s awesome application made him one of the strongest contenders but after meeting him and talking to him, it was clear he was the right person for the job. He’s smart, funny, talented and quietly confident, without being pushy. After less than 2 weeks in the job, Colin has settled right in and we’re really enjoying having him in the team. He’s already getting stuck in, has hand drawn new avatars for everyone and is off to his first web conference with Sarah next week – Web Directions in London. In the coming weeks and months, Colin will be introducing himself and blogging about his Apprenticeship at Mark Boulton Design, with the hope of inspiring other companies to follow our lead.View the conversation on Twitter →Twitter:Reply on TwitterNext Post: Alan who? This is the REAL Apprentice! If you’d like to work with us on your project, please get in touch. Download our project planner, answer a few simple questions and we’ll get back to you within one week. Books for Web DesignersFive Simple Steps is an imprint hell-bent on publishing simple, easy-to-read book for the web professional.